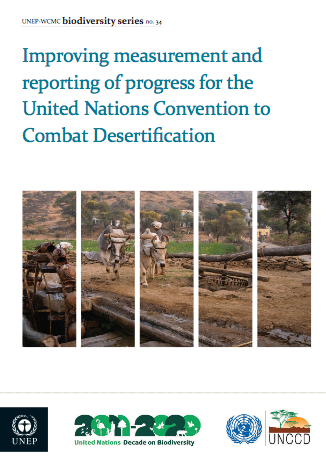 The UN Environment Programme-World Conservation Monitoring Centre (UNEP-WCMC) has prepared a publication titled, 'Improving Measurement and Reporting of Progress for the United Nations Convention to Combat Desertification (UNCCD),' which presents the UNCCD's experience with introducing the Performance Review and Assessment of Implementation System (PRAIS). 6 June 2013: The UN Environment Programme-World Conservation Monitoring Centre (UNEP-WCMC) has prepared a publication, titled ‘Improving Measurement and Reporting of Progress for the United Nations Convention to Combat Desertification (UNCCD),’ which presents the UNCCD’s experience with introducing the Performance Review and Assessment of Implementation System (PRAIS). The publication, which was released as part of UNEP-WCMC’s Biodiversity Series, no. 34, reflects on lessons from the Global Environment Facility (GEF) funded PRAIS Project and the UNCCD’s Impact Indicators Pilot Exercise, which tested a suite of indicators for measuring progress towards the UNCCD’s Strategic Objectives. The publication notes that the introduction of PRAIS was successful, and only a small number of countries submitted their national report using an offline format. The project also tested a regional approach, including through a training-of-trainers using existing regional technical centers, which is reported to have promoted cooperation and capacity building. One notable lesson learned is that coordination mechanisms at many levels play a fundamental role in the success of the introduction of such a new process, particularly one conducted so rapidly. The publication also highlights that most national focal points reported that data collection was the most challenging task within the new system. The publication recommends improving the steps for data validation and greater access to data to enable enhanced analysis.